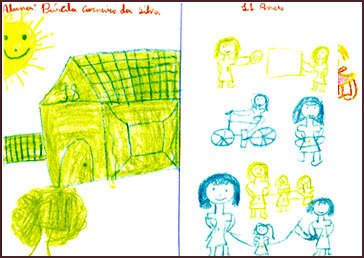 I asked the children in Brazil to draw 2 pictures on one page. One side was to be their “home” and the other side was “what they love”. The age groups ranged from 5-9years old and the samples were taken from 3 different programs: (PLAN International. ICP. Projecto de Meninos de Luz). The pictures of their “home” are very special and telling to me especially since many of them live in favelas. (shanty towns).